We remember photographing a young beekeeper, Mikayla Hagan of the Rio Vista (Calif.) 4-H Club, when she delivered presentations at Solano County 4-H events. Yes, 4-H'ers can enroll in beekeeping projects--if a club offers them. And they should! Rewind to the 2012 Solano County Project Skills Day. We were photographing an enthusiastic Mikalya talking about her beekeeping project to Mike Reagan, then a member of the Solano County Board of Supervisors. Her project: "Honey Muffins." She won a showmanship award, the highest award given. 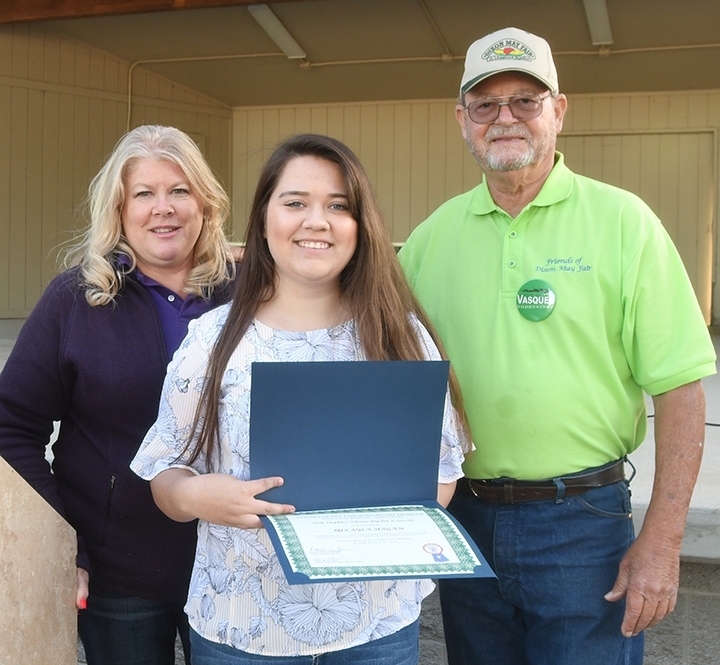 Mikalya is a senior at Rio Vista High School and the recipient of one of six college agricultural scholarships awarded by the Friends of the Dixon May Fair. In fact, she won the Jack Hopkins Scholarship of $1,500, the top award in the two-year community college category. The little girl fascinated by honey bees now plans a career as a large animal veterinary technician. “All my life I have loved being involved with animals, which has driven me to become a large animal veterinary technician," she wrote in her scholarship application. A longtime member of the Rio Vista 4-H Club, she joined the youth organization in first grade. “My first animal project was to raise two market goats for the Dixon May Fair." “I have continued to show animals up until the present," wrote Mikalya. "In that time, I have raised honey bees and have shown market steers, market chickens, roaster ducks, market turkeys and many market and breeding meat goats, exhibiting several champion and reserve champion animals at both the Dixon May Fair and Solano County Fair. She joined the Rio Vista FFA when she started high school and received several degrees, including the chapter degree and state farmer degree. She plans to obtain her general education at Solano Community College and then transfer to Cosumnes River College, Sacramento, or Carrington College, Sacramento, for the veterinary technician program. The Friends of the Fair, the service-oriented and fundraising arm of the Dixon May Fair, has awarded an incredible $186,250 in college scholarships since its founding in 2000. The organization raises funds primarily through the sale of beverages sold at the Dixon May Fair. 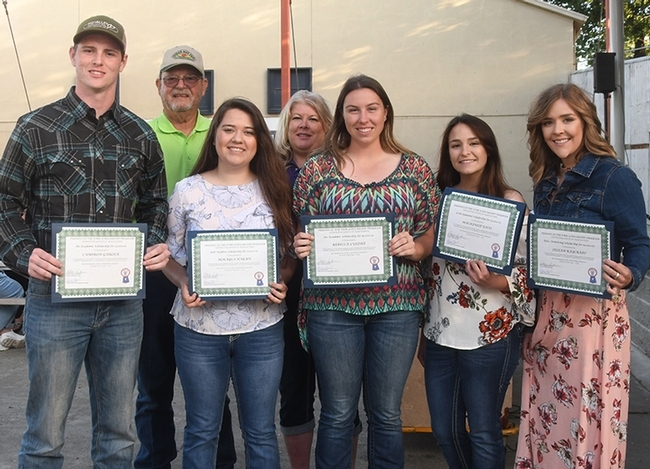 “We're proud to help our college students majoring in agriculture,” Donnie Huffman of Vacaville, president of the Friends of the Fair since 2000, told the crowd gathered Wednesday, May 30 on the Dixon May Fair grounds. “This was our 19th year at the fair and one of our best years.” At this year's fair, May 10-13, the gross sales of beverages totaled $164,446. “This is where we get our money for scholarships,” Huffman said. Jillian Raycraft of Dixon, a 2015 graduate of Dixon High School and a student at California Polytechnic State University (Cal Poly), San Luis Obispo, received the top award, the $3000 Ester Armstrong Scholarship. The scholarship memorializes a fair industry veteran who served as interim chief executive officer from 2006 to 2009. Career plans: agriculture finance and policy. Mackenzie Davi of Dixon, a senior at Dixon High School and soon-to-be student at California State University, Chico, received the newly created $2500 JoAn Giannoni Award. The annual award honors a Dixon resident who served as the long-time scholarship chair and secretary of Friends of the Fair. Career plans: agricultural teacher. Halie Pringle of Vacaville, a 2018 graduate Vacaville High School and a pending student at Solano Community College, won the $1250 award. 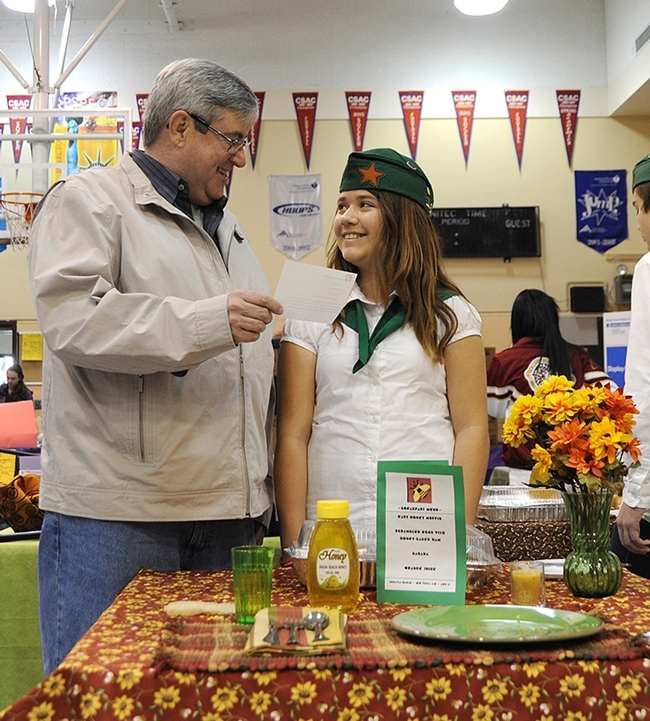 Career plans: agricultural business/soil sciences. Cameron Garlick of Dixon, a 2017 graduate of Dixon High School and a second-year student at Butte Community, Oroville, won the $1000 award. Career plans: plant crop advisor. It's good to see organizations such as the Friends of the Fair honor our youth, our leaders of tomorrow, and skilled in agriculture. Scholarship chair Carrie Hamel of the Friends of the Fair--she's a finance officer with the Department of Public Health Sciences, UC Davis School of Medicine--said applicants are scored on personal, civic and academic experience; academic standing; personal commitment and established goals; leadership potential; civic accomplishments; chosen field in the areas of agriculture. Most recipients have experience in 4-H, FFA or Grange—activities desired but not mandated. Some successful applicants have all three! As far as we know, only one scholarship recipient enrolled in a 4-H beekeeping project and learned to keep bees, our littlest agricultural workers.